In just six weeks or so, millions of new college students will arrive at their new campuses, where at some point they will have to decide on a major. As they write the first tuition check, parents may wonder which fields of study are most likely to lead to rewarding careers, and which back to the couch in the basement? The Census Bureau is here to help. 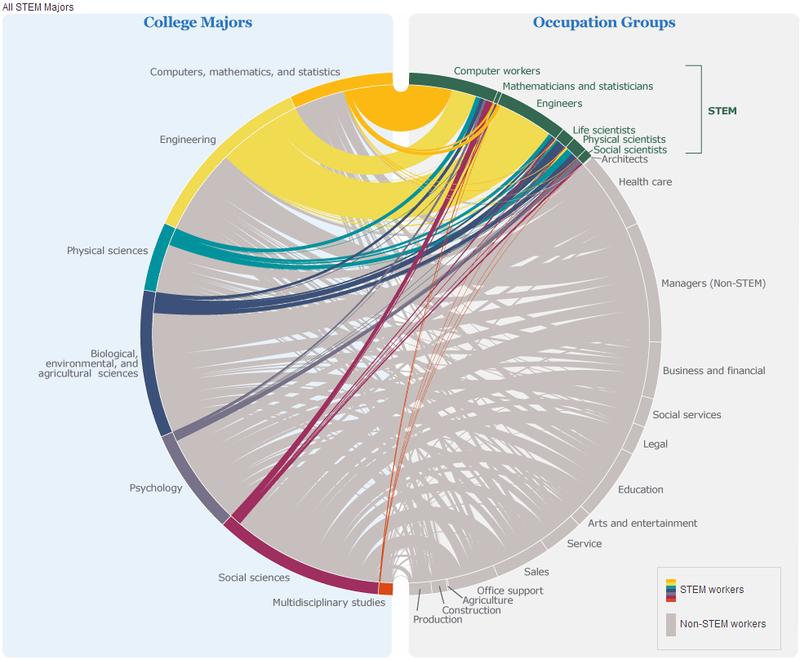 The chart above, based on data from the 2012 American Community Survey, shows the relationship between college majors and occupational groups. On the interactive version, hovering over a major will show which fields its graduates ended up working in. The thickness of the lines reflects the share of people in each major-occupation combination. You can also hover over an occupation to see which majors it hires from, or switch the chart’s focus to non-STEM majors such as business and literature. And in both STEM and non-STEM modes, you can narrow the chart by race, ethnicity and gender — and learn, by exploring the data table, that women account for fewer than four of every 10 bachelor’s degrees in STEM majors. Chart of the Week: Which states have the most nurses, and where are they paid the most?